The Iraqi Security Forces (ISF) launched a new operation on Wednesday 7 October to encircle Ramadi from the north and west. Institute for the Study of War (ISW) said the objective was to cut ISIL’s supply lines between Ramadi and Hit. 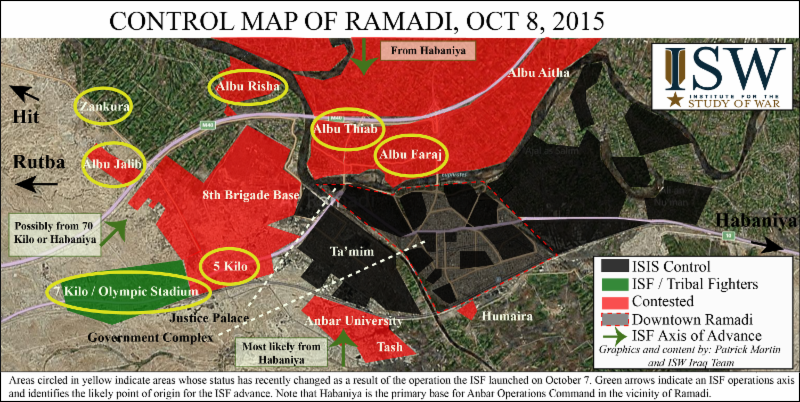 Retaking of Ramadi has been the main effort of the ISF since July. U.S.-led coalition and Iraqi airstrikes against ISIL targets and in support of the ground operation are ongoing. ISW reported that clashes continue between ISIL and ISF units in the Anbar University campus south of Ramadi. - U.S. backed offensive in Iraq. - Russian backed offensive in Syria.